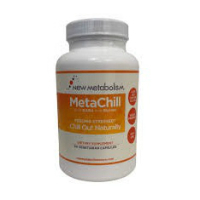 MetaChill is a dietary supplement that has been formulated to help provide calming support when life gets stressful. In addition to helping you keep calm when stressed, this product, which comes from New Metabolism Inc., also supposedly works to help balance mood, and support adrenal glands. When this MetaChill review was written, a single serving size (1 vegetarian capsule) was composed of the following ingredients; Niacin (100 mg), Vitamin B6 (10 mg), Pantothenic Acid (100 mg), GABA (300 mg), Glycine (200 mg). Of all the ingredients listed above, the two that the MetaChill product label draws attention to are GABA and Glycine. GABA (Gamma-Aminobutyric Acid), is believed to work by blocking brain signals and is often used for relieving anxiety and improving mood. Although some research has found that GABA is possibly effective for reducing blood pressure in people with high blood pressure and helping to alleviate motion sickness, there is insufficient evidence that it is helpful in reducing stress, tension, anxiety and depression in people who are stressed. Glycine is an amino acid that is used by the body to make proteins. It also plays a role in the transmission of chemical signals in the brain. It is possibly effective for treating schizophrenia, but there is insufficient evidence regarding its ability to improve sleep quality in people with poor sleep quality and its ability to improve memory and mental performance. MetaChill is free of gluten, corn, wheat and toxins, and is made with non-GMO ingredients. It is vegetarian-friendly and has no artificial flavorings or preservatives. That being said, simply because the product is well made and is “natural” does not mean that it is safe for everyone to take. While most users seem to be able to take this product without experiencing unpleasant side effects, the most common include gastrointestinal upset. It is important to note that there is no guarantee that MetaChill will help you to feel less stressed or emotionally balanced. This product has never been proven effective as a treatment for stress or as a stress aid. If you are suffering from chronic stress, depression, anxiety or some other emotional imbalance that is negatively effecting your life, it is strongly recommended that you discuss how you are feeling with your doctor. You may require medical treatment or some other form of therapy to help treat your condition. Always take your mental health seriously and seek out the best treatment or stress aid that is the most ideal for your lifestyle. This may include MetaChill or it might not. Talk to your healthcare provider.